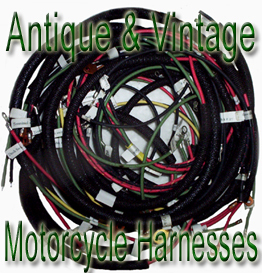 Harley Wiring Harnesses 1903 to 1966 There are	32 products. one J models accessories loom harness.Fits:J models using handle bar cross bar for lighting and amp meter & Speedometer light.Contains as Follows:The handle bar cross bar lighting wiring for spotlights or accessory lights.The accessory Amp meter and speedometer light loom or harness. 1920 to 1928 Harley J & F cloth covered wiring harness with correct terminals including brass flags.Bent over soldierd wires to terminals like originals.Cloth covered shielding. One complete set wiring harness for the harley single models 1926 to 1934 B , AA , BA , CPeriod color cotton braid wire. each wire terminal end tagged for easy installation.Each wire soldered.Should you have the kidney shape dash let me know. Purchase the spark wire and terminal ends on another listing. One complete set wiring harness fits: 1929 and 1930 harley single model dual headlights C,B,BA models.Complete cotton braided wire with sheilded covering.Also has each wire labeled for easy installation.Each wire soldiered like originals Should you have any questions please email. This sale is for One 1929 Harley JD Twin Headlight wiring harness complete. This sale is for one cotton braided harness fits 1931 to 1935 Harley V,VL,VLH,R,RL,RLS.